To most of you it’s 2014, but to me it’s the year of weddings. I’ve been invited to five his year, with the privilege of being the Maid of Honor to my best friend in one. Since May, I’ve witnessed a variety of wedding ceremonies and receptions, from a vineyard to a traditional church and hotel ballroom to a backyard. While budgets and preferred styles for the actual wedding may fluctuate, there is one point where all weddings find a commonality: invitations. Frankly, I’ve always figured a Facebook event would do the job just fine. (Yes, I’m cheap). But I’ve been told that’s a no-go. When my cousin Bridget sent out the invitations to her wedding I was floored, relieved and wanted to send her major snaps for ingenuity. Why? Because Bridget’s wedding invitation arrived in my inbox, not my mailbox. Why was I relieved? Because this opens the door for me to do something similar one day, in the very distant future. 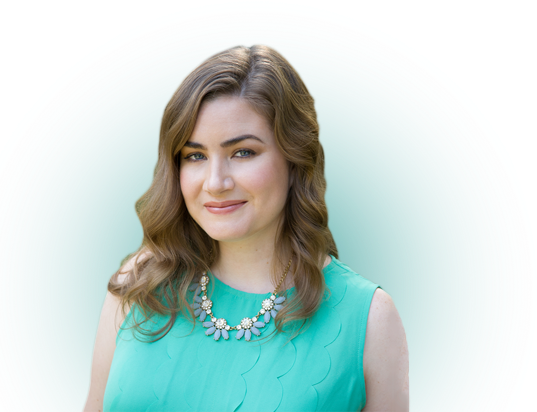 Using a website called Paperless Post, Bridget and her husband-to-be designed a beautiful invitation, and saved themselves hundreds of dollars. * Not to mention tons of time, because guests RSVP right to the email, which eliminates having to keep track of all those tiny RSVP cards. The terrifying website Cost of a Wedding says the average cost of wedding invites is $812! Have you ever noticed just how much paper goes into a wedding invite? The big invitation, then that little one about the reception, the RSVP card, maybe one with directions and another with details on brunch for the next day? I’m sure Paperless Post would please the environmentalist crowd. 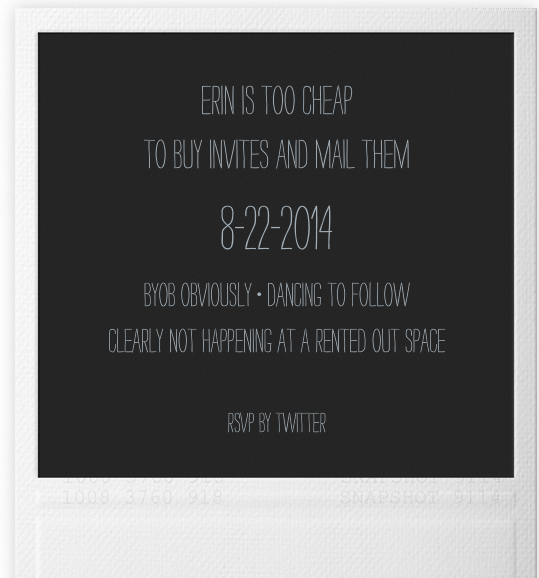 I decided to investigate just how much it would cost to invite people to a hypothetical party using Paperless Post. When you sign up for Paperless Post, for free, you’re automatically given 25 “coins”. You can also buy coins, starting at 20 for $6. I went through the process of creating my own invitation to play around with price points. 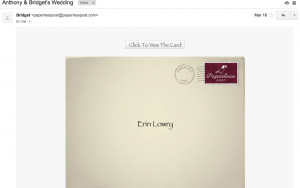 Paperless Posts offers a variety of free, customizable cards. Naturally, I started there. There are plenty of beautiful invitations for people going the wedding route, but I went with a fun card to send out for my fake party. 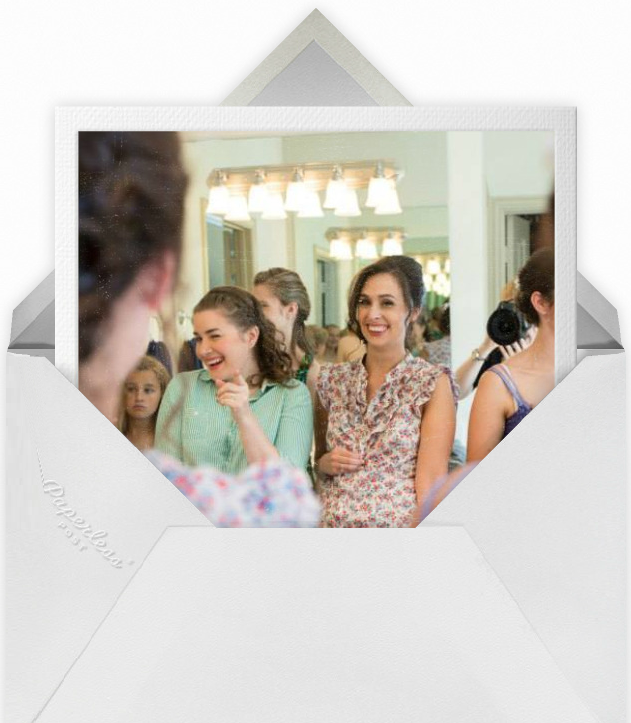 I created a card with an envelope, so people feel like they’re opening up a virtual card, which is kind of fun. After designing the card I got to the checkout and started plugging in guests. It cost one coin per guest and the added envelope touch also set me back a coin. (You can also add a customized stamp for another coin.) So, to send the invite to two guests for a grand total of four coins (look at that fast math!). If I were using this same system for my wedding, and had 200 person invite list (completely realistic with the size of my extended family), I’d need 400 coins to send out my invites. It would cost $60 to buy 400 Paperless Post coins. That’s significantly cheaper than printing actual cards and mailing them out to guests. I know the Miss Manners of the world would gasp in horror. Call it uncouth if you’d like, but I find the snazzy email invite incredibly savvy. 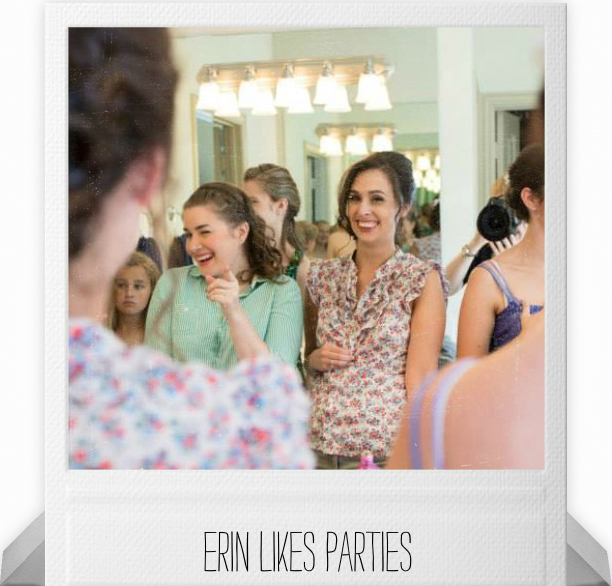 Here is the snarky invitation to my fictional party! * I later learned they did traditional invitations for the older generation, but they still must have saved a bundle on invites! Awesome invite! lol. We got lucky with ours. My wife’s uncle works for a printing press and he was able to do all of ours for free. We just had to pay the postage—and the hours upon hours of writing out addresses. I’m SO glad people are doing this, makes a whole lot more sense. 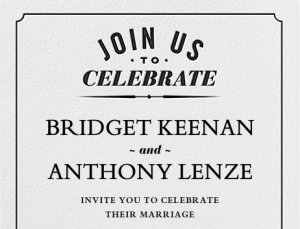 Though, unfortunately, I still know my cultural circle would freak over an online wedding invite. They’d say, in Ukrainian, “how inappropriate”. Yeah, I know I have relatives who will think it’s inappropriate, but I just don’t care. I’ll have some printed invites for the older folks who don’t utilize email much, but otherwise people are getting evites so I can spend more money on the actual event! I don’t know how I would go about it. I think it would be nice to save money, but an email seems so impersonal whereas mail seems so much more, personal. 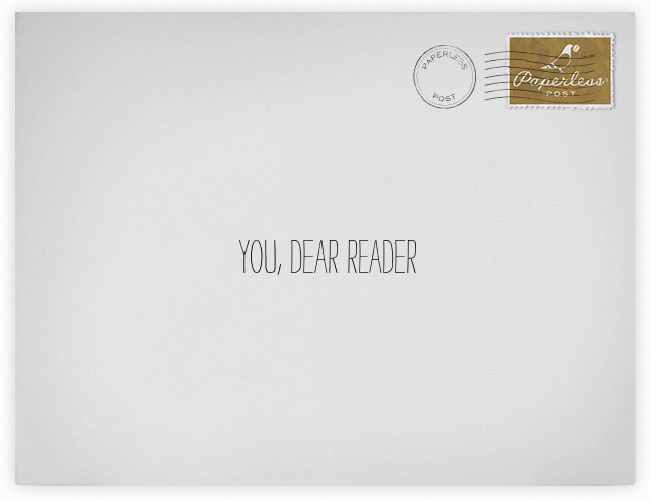 People never get mail anymore (probably because it costs so damn expensive), but I would rather get an invite that way. Again, if I were thinking economically, I would want to save money, as well. I understand that feeling, but it isn’t personalized mail. There is no special letter and the inside doesn’t even have your name on it most of the time. It’s just the outside addressed to you. Plus, I throw away 99% of wedding invites I get and assume most others do the same. I know this post is old, but I’m planning my March 2017 wedding and we’ve firmly decided on Paperlesspost for our invites. Save the dates already went out via the same site, and was a SMASHING success. I could see who got the invite, who opened it, and who RSVPed. I called the few stragglers who never opened it or never RSVPed just to let them know it was in their inbox and to save the date. I LOVED IT! Now we’re working on our invites and have it set so it’s a very quick RSVP – click here to RSVP, guests are transported to our website and RSVP there. I know Paperless Post has their own RSVP method, but we chose to transport to the our website. Much easier than asking people to type out a website we sent them on a paper card! We estimate that by using Paperless Post, we’re saving $400 dollars on save the dates and invites – In my opinion, that’s money better spent on booze at the event!! That is awesome! Such an easy way to save some money for sure. That’s what we did to announce our wedding/dinner reception although we had a very small gathering. It may not jive well with everyone especially the older generation but how many wedding invitations have you kept lying around over the years? In my case, the answer was zero. In my first wedding I went the ultra traditional route and spent insane money on embossed invite on high quality paper. I wasn’t about to waste money like that again. I’m with you, I rarely keep wedding invitations. Sometimes I put save the dates on my fridge because they often have cute pictures, but otherwise I don’t save them. When my wife and I were planning our wedding, I honestly couldn’t believe the cost of everything… which is probably why we eloped. But I know my FIL spend about $300 just on the cost of printing the wedding announcements he wanted to send out, and probably another $50 or so in postage. Insane to me. I would definitely have no problem with the paperless route. I check my inbox more than my mailbox nowadays! It’s scares me that the average is over $800!!! 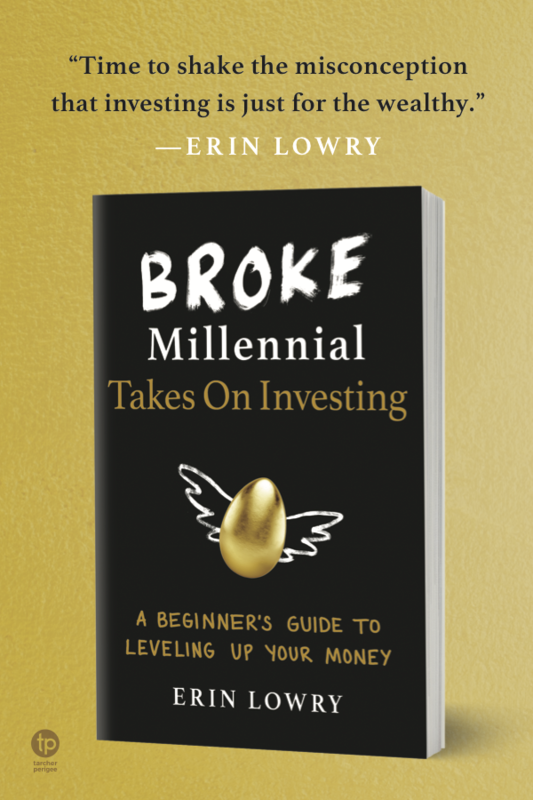 How much must people be spending on the high end? I hope doves deliver those wedding invites. You sure could print them at home on some nice card stock. Save oodles of money! 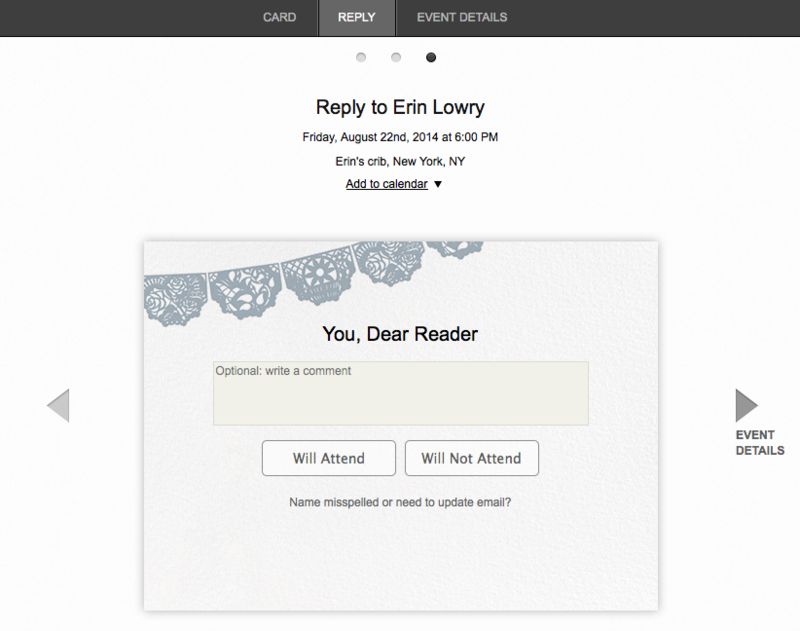 I received my first digital wedding invitation this year and was pleasantly surprised. It still looked professional and classy. Though with a touch of personality since my friends were able to customize it in more fun ways. Agreed! You can put photos in there as well and there are so many styles to pick from that you’re bound to find one that suites your personality. I did not know about this site, but I love the idea. Why do we have to send out invites? While we are already married, I will pass this on to others. You can always use it for future parties too! This made me chuckle, especially your party invite. Now only if I can get my fiance to jump on board with idea. Pitch as a way to put more money towards something else awesome, like music or food! I love this. I don’t see a reason to send out actual invitations except for the fact it’s traditional. I recently received a really cute invitation, but what am I going to do with it? There’s no reason to waste so much paper and money (and time). I would probably do the same and give my older family members a physical invitation, but that’s about it. I know grandparents and older aunts and uncles like the paper ones, but I think cousins and friends are totally fine with e-cards! I got a birthday party invite for my kid from Paperless Post and I seriously wished they had this when I got married because I think it is brilliant. We spent a ton of money printing invites, and rsvp cards, it was crazy. Plus, it took forever to get everyone’s mailing address and some people had moved so you would get returns and have to waste more postage. I think this is an awesome solution. I love that they’re doing it for kid’s parties. Plus, it’s easy to put it right on your Google calendar or iPhone calendar. Love paperless post! I actually use it for work a lot–much cheaper than paper invites and, since it’s totally customizable, we can insert our logo, photos, the works! I wish it had been around (or that I’d known about it) for my wedding invites 6 years ago. I totally would’ve paperless post-ed it! P.S. If you need a bridesmaids dress from Ann Taylor or J Crew in a size 0, 2, or 4–chances are, I own it and would be happy to lend it to you :)! Good to know about bridesmaids dresses. I looked into Ann Taylor ones for my friend’s wedding recently, but ended up just sticking with the ones she’d picked. I love that businesses are going paper-less now as an option. I also think these businesses need to make it more aware to people that they are doing this because people could be doing something eco-friendly with no effort at all. Eco-friendly and wallet friendly. It’s a wine for everyone (except the paper printing business). I have received a few FB wedding invitations over the years and have just ignored them. I am a FB fan but I just can’t take a wedding invitation seriously if all you had to do to include me was click on my face or a list that I’m sorted into. Yeah, my FB quip was a bit of a joke. I wouldn’t really do that — mostly because then everyone can see who is invited and that seems like a recipe for hurt feelings. I think paperless post is the perfect solution. But you’re right that it does depend on who is paying. Parents get a bit more say if they’re forking over the dough. God I wish more people would do this. I have literally never received an online invitation to any momentous occasion. Yet those are the occasions I MOST need to have online to put in my Google calendar! Paper invites get lost right away in our house. I did online invites for our wedding – selfish choice as it’s what I would personally want but I suspect most people we invited prefer physical invites. I like that you went with online invites though! Do what you want to do, it’s your wedding after all! This is really cute, actually! I think I would be happy to do a paperless post thing for my wedding *if* I get married and then I would like to send out a nice thank you card for real. I like trees and I like saving money, so this just makes sense. I received an wedding invitation and asked where it came from. My friend said it is from Paperless Posts. I looked it up on the net and found so many perfect invitations. I am planning to use it also for our wedding this December and it seems my fiancee would love this. Awesome! I love to hear other people switching over. I like this idea for the younger generation in the family, innappropriate or not, I think if they support you they will attend. Change is bound to occur with all this new technology, if they can stay on FB for hours, they can recieve and reply to a wedding invite by mail. (No Biggie) I rather apply any extra money to give a better entertainment/ food experience for my guests. If someone doesn’t come to a wedding because they didn’t like the invite, then there is a much bigger issues there. I’m 100% with you on wanting to put those funds elsewhere for a more enjoyable experience.